Which Countries can’t see York PEN’s website? WordPress has a handy little feature called ‘Stats’, which satisfyingly shows all of our website’s views country by country. For the website administrator it’s an incredibly addictive tool, akin to getting Facebook Likes, only they’re Likes from actual countries, rather than Friends that you’d cross the road to avoid. With this map, however, comes a serious message. As these stats grow, we develop a graphic image of internet censorship. Since the end of the first quarter of 2012, when we moved from Tumblr to WordPress, we’ve been viewed by nearly 100 countries around 17,000 times. 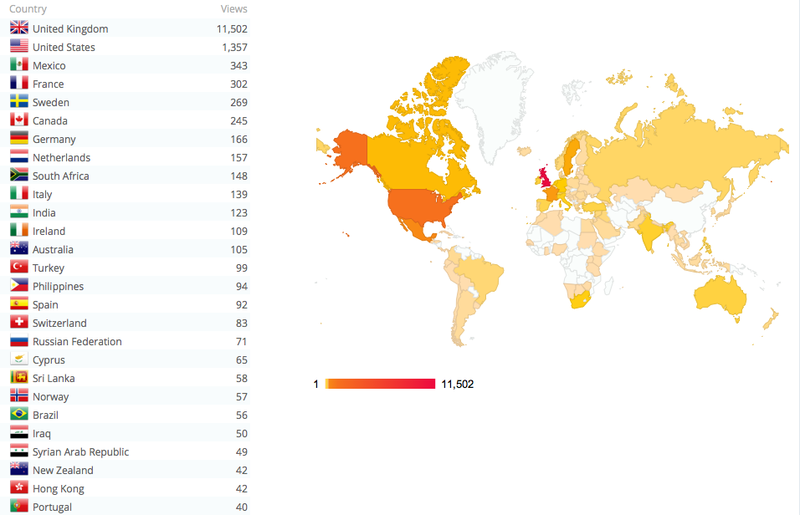 The top of the list is unsurprising – the UK (11,502 views) comes first, followed by the US (1,357 views). I find it harder to account for Mexico (343 views) which comes in third, given that we’ve never run a campaign for a Mexican prisoner of conscience, but I laud them for their taste. France (302 views) in fourth is understandable given its proximity in and cross-pollination with the UK, while we can blame Sweden’s (269 views) fifth-place prominence on the list single-handedly on Alice Olsson, our Scandinavian Chair from 2013-2014. Beyond the top five, those countries higher up the list are frequently related to our campaigns. We wrote articles about Turkey (99 views) during the 2013 Gezi Park and Taksim Square protests; as well as South Africa (148 views) being an anglophone country, we’ve written about Jonny Steinberg’s visit to York as part of the Prison Fictions and Human Rights series in 2012; we campaigned for Prageeth Eknaligoda, from Sri Lanka (58 views), with our exhibition Drawing Blood in Spring 2013; we interviewed cartoonist Ali Ferzat from Syria (49 views). And I’m glad that even after all the scrutiny we put the Sochi Olympics under, I think that Russia (71 views) still has access to York PEN. Of course, even if a country has historically been able to access our website, it doesn’t mean that the website isn’t blocked now. Nor can we know for sure whether our website has been formally blocked by a government firewall, or whether an absence of views from one country or another has been the result of chance, or lack of interest. We can, however, make educated guesses. Our large gaps across swathes of sub-Saharan Africa are probably the result of poor internet reach. Perhaps the people of Svalbard or Greenland simply have other fish to fry, since I don’t suppose that Norway and Denmark are attempting to censor the internet freedoms of their limited polar citizens. I imagine we’ve simply written nothing of interest to Slovakians, Montenegrins or Macedonians, the only European nations missing from our pack (sorry!). Indeed, some of our writing is very York focussed, and probably not that fascinating for the average Moldovan (although we have 2 views) or Bruneian (4 views). On the other hand, though, it has always been part of the unwritten manifesto of this website that our content should have worldwide appeal. It is our hope that a human rights group anywhere in the world might find something of value on these pages, and perhaps these multinational viewing figures do show some successes on that front. If that’s true, however, there are elephants in the room – those countries with vast populations, some form of human rights culture, and relative technological advancements who have not racked up a single view. Of these, the bull elephant is China (0 views). Though English is not a major language in China as it is in, say, India, which has around the same population and which has viewed the website 123 times, to suggest that there are no English speaking activists in China who might take interest in PEN’s work is laughable, especially when we have relevant posts like our translation of the Chinese poet Hai Zi, and our campaign for Professor Ilham Tohti, whose trial for separatism began yesterday. Whether or not York PEN was consciously blocked by an efficient civil servant in Beijing, or whether the Firewall automatically blocked access based on the words and phrases associated with our first post (which contained such dissident words as ‘censoring’ and ‘raise awareness’), the fact that not a single view has been registered shows the efficiency of a chilling system. China has spent 10 years building what is so charmingly known as the Great Firewall of China (or officially, the Golden Shield Project), employing up to 50,000 people daily to enforce its internet censorship. Rather than keeping out Mongols, the Firewall prevents access to any website deemed contrary to Communist Party values, as well as Facebook and Twitter, replaced by China’s own microblogging platform Weibo. And while Weibo is privately owned, it routinely submits to any request by the authorities to delete posts or users deemed radical. Of course, there have been responses to the Firewall among the Chinese public, and China wages a forever war against online activists. Some Chinese dissidents have set up Free Weibo, which reposts deleted blog entries. The use of proxy sites is commonplace, despite what the Chinese authorities would wish us believe, and can enable people to access Facebook if they really want to. Whether the York PEN website has been viewed from China via proxies cannot be determined, since in all likelihood these views would not be registered in WordPress’ stats. Alongside China is North Korea which, it hardly seems necessary to mention, also has 0 views. Both countries are and have always been on Reporters Without Borders’ Enemies of the Internet list. The North Korean public’s total lack of awareness about York PEN is entirely foreseeable since, as one BBC journalist put it, North Korea’s internet ‘resembles more an extravagant company intranet than the expansive global network those outside the country know it to be,’ and the whole service could torn down at any time if Pyongyang saw fit. Their version contains amusingly quirky code, such as a line which marginally increases the font size of Kim Jong-un’s name relative to the rest of the text whenever it crops up. And even this only applies to so-called ‘elites’, or selected academics and scientists; normal citizens have no internet access at all. Libya is another case of no views. As one of the most repressive regimes in the world, Muammar Gaddafi’s government had very little incentive to promote a flourishing internet, and during the Arab Spring, Gaddafi cut internet access altogether several times in February 2011, allegedly to make the organisation of the citizen opposition movements far harder. At the time, the efficacy of these measures was questioned, particularly as according to the OpenNet Initiative only 6% of Libyans at the time had any internet access, though according to OpenNet’s coordinator, Jillian York, those 6% were among the most educated demographic whose influence should not be underestimated. Since the fall of Gaddafi, journalists have seen unprecedented media freedom, although this does not preclude new repressive laws, born from the current power vacuum, from being formally adopted in the coming years. To this day service costs remain high, and reach, patchy, but I’m hopeful that York PEN’s failure to penetrate Libya may soon be reversed. Iran (0 views) is another of Reporters Without Borders’ Enemies of the Internet. Iran’s censorship has steadily increased since the Millennium, particularly after the 2005 election of conservative president Mahmoud Ahmadinejad, imposing harsh sentences and harassing online bloggers and activists. They use an internet content filter called SmartFilter, designed by a US company who claims that Iran are using it without a licence. Then, in 2010, the Revolutionary Guards set up a ‘cyber army’ to wage war with ‘destructive’ networks, arresting, intimidating, and even sentencing to death hundreds of internet users. More worryingly, in March 2012 the Supreme Leader of Iran, Ayatollah Ali Khamenei instructed parliament to set up an internet-oversight body, which – deceptively amusing as it may seem – is officially titled ‘The Supreme Council of Virtual Space’. Three of the twenty-two Internet Service Providers in Somalia (o views) have been found to pervasively filter web content, this time using a piece of Canadian software called Netsweeper, but like Iran, they also have one of the lowest internet penetration rates in the world. Perhaps more worryingly, is that in January this year the Islamist militia Al-Shabaab banned the internet outright in southern territories it controls, to limit online coordination among the populus. Turkmenistan (o views) too, also an internet enemy, has very limited internet access and is consistently listed as having one of the most regulated internets in the world, as well as a heavily (self-)censored press. Surveillance is rife, and it is standard practice for such human rights sites as ours — as well as Facebook, Youtube, and Twitter — to be blocked on their Turkmenet. Close parallels can be seen between our map and Reporters Without Borders’ 2012 map of press freedoms. Venezuela (0 views), Belarus (1 view) and Eritrea (o views) are all listed under Reporters Without Borders’ ‘under surveillance’ heading. OpenNet’s 2012 report on Venezuela found no evidence of internet filtering, though evidence did emerge in early 2014 that the country had temporarily blocked images on Twitter of protests against high inflation and shortages. Eritrea too has no filter; it’s case is more like Libya’s, with a low internet penetration, and a culture of fear that governs the online actions of its citizens. By contrast, Belarus has a relatively extensive filter which selectively blocks political content, but perhaps it is not as effective as China’s (unless our single Belarusian website viewer is the government employee who blocked it!). Obviously, this list could go on, but it becomes harder to judge what is intentional and what is circumstantial as you look increasingly at countries with already very limited access to the internet. Only time will tell us at York PEN about Afghanistan, Uzbekistan, Kyrgyzstan, Paraguay, Papua New Guinea, and indeed, the majority of Africa, and even then we will have no means to actually verify that York PEN is specifically being filtered. As the website continues to grow, the picture of press censorship will only become more stark. And indeed, writing this article may well be a catch-22, hacking off the censorship officials from countries that I’m hoping might visit. Perhaps, at some point, I should write a few superficial articles targeted at these countries to see how they respond, the online equivalent to poking each country with a stick. In the likelihood that I’m not going to have time to do that, I’ll keep logging onto Stats every day, get my daily dopamine rush, and I’ll let you know if anything changes. Seb Brixey-Williams was Chair of York PEN between 2012-2013, and writes on a range of political and ethical issues. We have our first view from Venezuela! Not blocked after all? This entry was posted in Comment and tagged Belarus, censorship, China, English PEN, Eritrea, Filter, huffington post, internet freedoms, Iran, map, north korea, press freedom, Somalia, surveillance, Turkmenistan, Venezuela, York PEN. Bookmark the permalink. Rubbish to throw out, or persons to take care of?